+ Biblical Fantasy (3480 words): Part 2 of Beginnings, A Journalistic Journey Through the Book of Genesis. + Leprechaunal Fantasy (975 words): Part 3 of a 4-part serial. Our hero, Joel Sanders, seems to have gotten himself into a bit o' trouble. 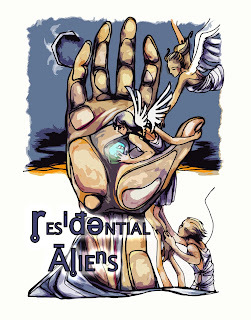 Joel’s hands were chained behind his back. Drums pounded out a steady beat as the guards at his elbows marched him up the stairs onto the platform where the guillotine waited. He was forced to kneel, his neck carefully positioned under the shiny, sharp-edged blade. He turned his head to see his executioner. 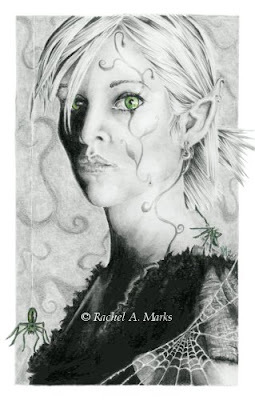 + Artist Interview (965 words): AKA Pixydust, Rachel Marks is an accomplished artist, author, wife, mom, homeschool teacher, and dirt bike rider. How did she get into fantasy? My favorite books as a kid were 'A Wrinkle in Time' and 'The Wind in the Door.' I loved anything dark and tragic and as a teen would sit for hours at a time sketching out 'The Crow' or a girl wondering a graveyard by moonlight. At first I hated my telepathy. I hated being able to read the forbidden thoughts in people’s minds, the horrible things they thought but had the decency not to say. + Speculative Flash Fiction (600 words): True friendship stands the test of time...and bad breath. “I’m hallucinating. Go away.” I walked out of my office without waiting for my over-worked imagination to come up with an answer and headed for the kitchen. + Supernatural Thriller (1800 words): There's a time to be born and a time to die...and a time to tell stories about what you can take with you when your time comes! “Just a few more things,” came a shout from the bedroom, followed by the noise of a minor avalanche that must have come from one of the closets. + Speculative Flash Fiction (990 words): A frightening but foreseeable future when freedom turns criminal. Nicole had heard rumors that this place had been a speakeasy way back in the early twentieth century during Prohibition. She couldn’t help but appreciate the irony; although she and her cohorts now met secretly for entirely different reasons, the practice was just as illegal. 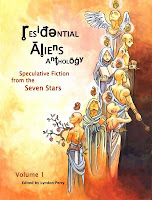 + PRESS RELEASE: Residential Aliens Anthology, Volume 1 is now available at Lyn's Storefront.